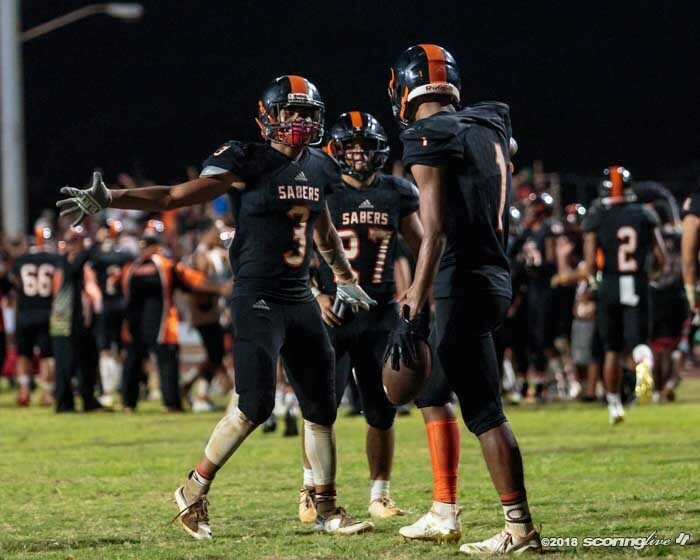 EWA BEACH — There was no quit in the Campbell Sabers Saturday night. 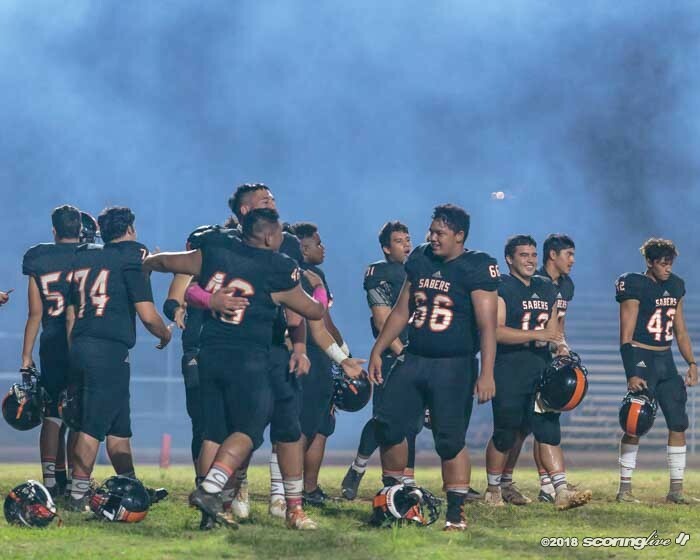 Titus Mokiao-Atimalala pulled down a 29-yard touchdown pass from Krenston Kaipo with 19 seconds left to lift No. 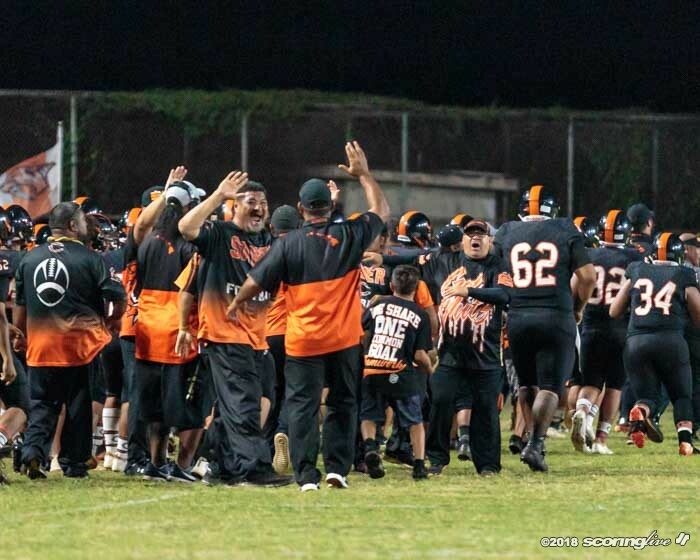 5 Campbell to a 28-27 win over No. 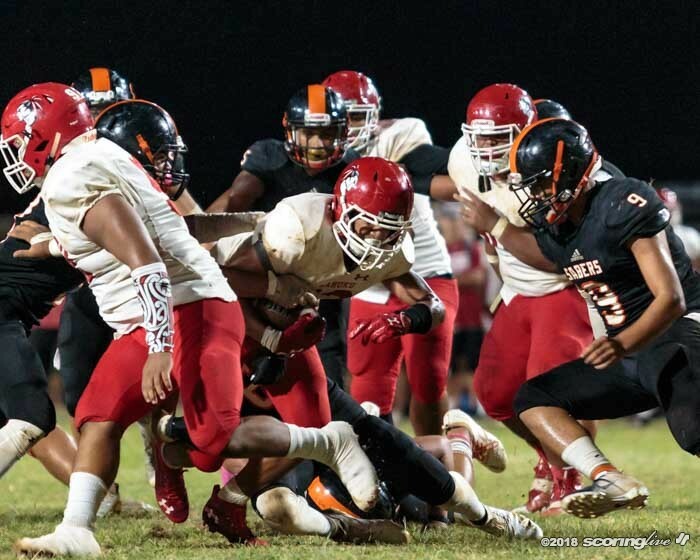 4 Kahuku before a home crowd of about 900 fans. 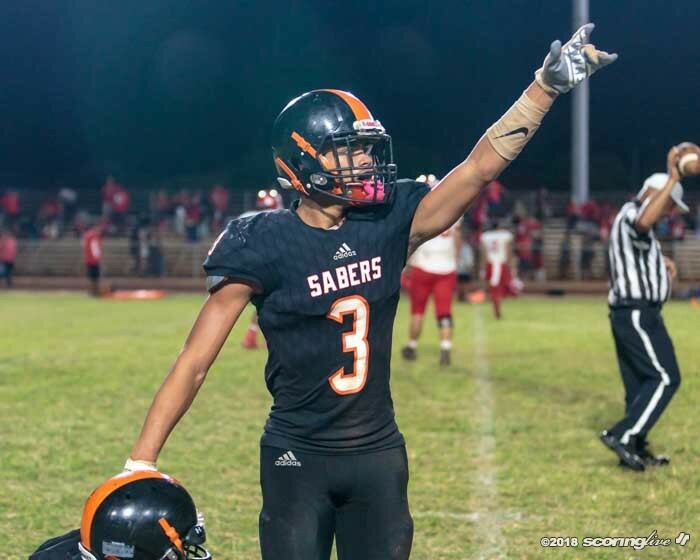 The Sabers erased three different second-half deficits to snap a three-game losing streak and improve to 5-3 overall and 2-1 in the Oahu Interscholastic Association Open Division standings. "They played hard tonight, man. They never quit. 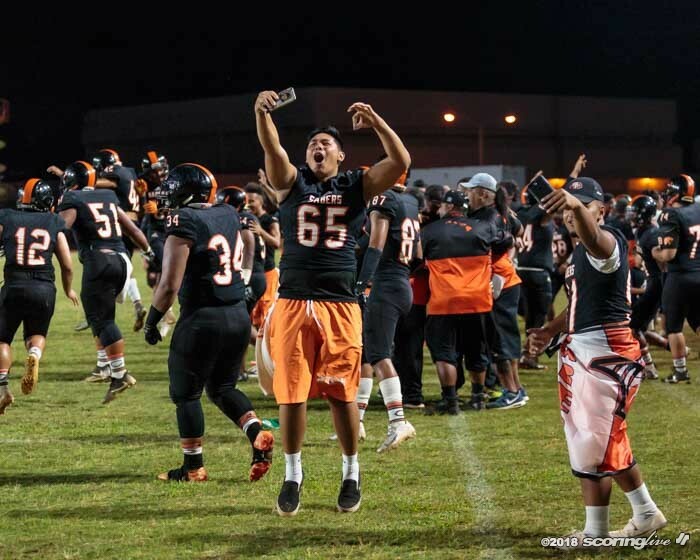 They never quit at all," Campbell coach Darren Johnson said of his team. "They believed in each other, they knew that we got some guys back — those guys made a difference — but they stuck together. I mean, we went through a three-game run that was rough on us." 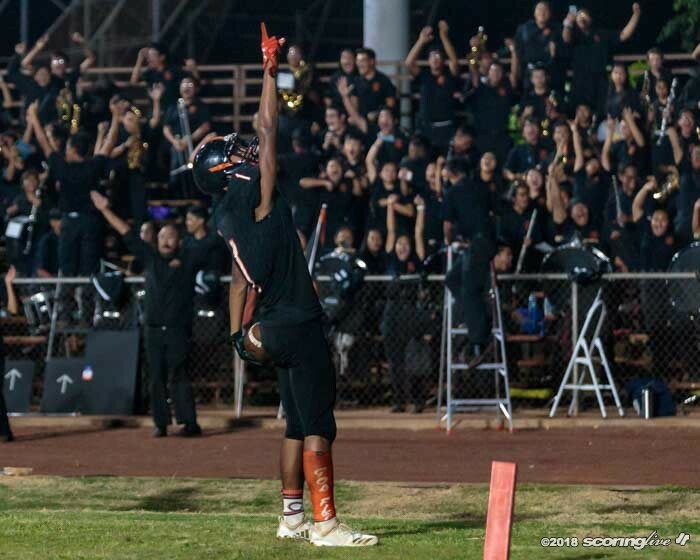 Mokiao-Atimalala, a sophomore wide receiver, recorded 10 receptions for 150 yards and also saw a significant amount of playing time in the defensive secondary. "It feels amazing. To come back and get a win after just a downfall. I mean, those three games that we did lose, it just humbled us, I feel like. 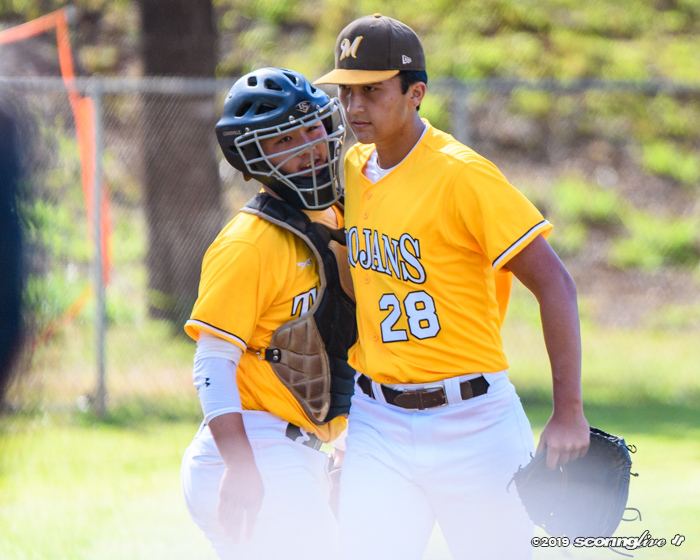 I mean, we were not doing all the great things, but we knew that we had to step up and that's what we did," Mokiao-Atimalala said. 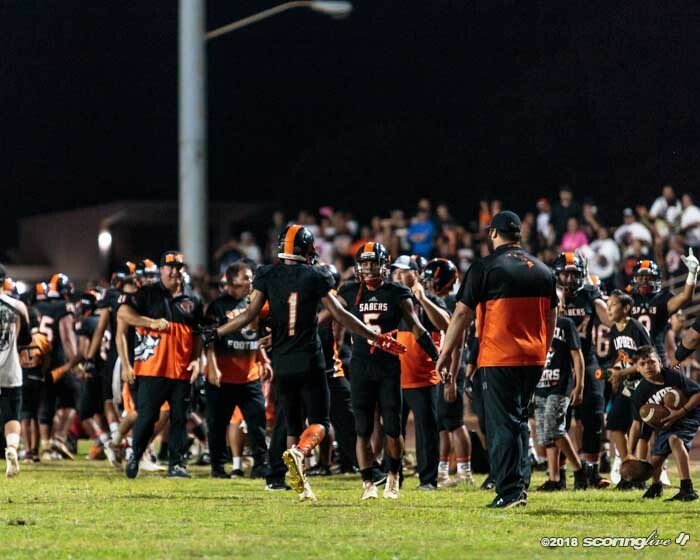 Campbell tied the score at 21 with 8:50 left in the game on a 3-yard screen pass from Kaipo to Pokii Adkins-Kupuka, but Kahuku orchestrated a 13-play, 79-yard drive that culminated with Robbie Sauvao's 21-yard TD pass to Mason Paulo with just 50 seconds to play. The hold on the PAT that followed, however, was mishandled and no kick was attempted before the holder was tackled. 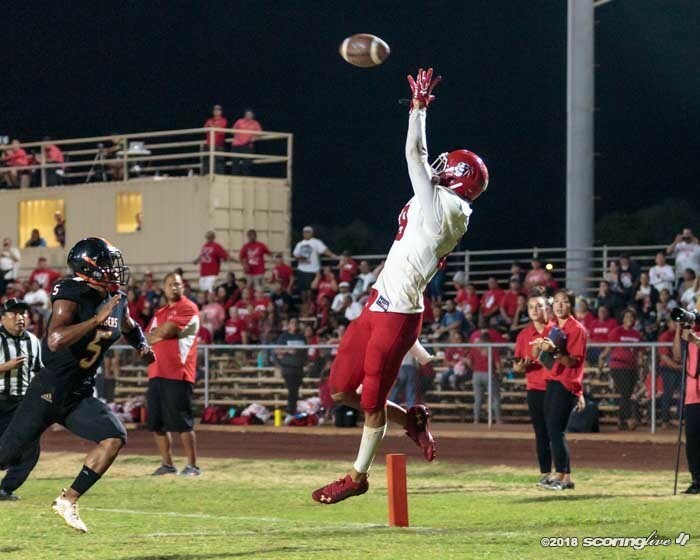 That kept the score at 27-21, in favor of the Red Raiders. 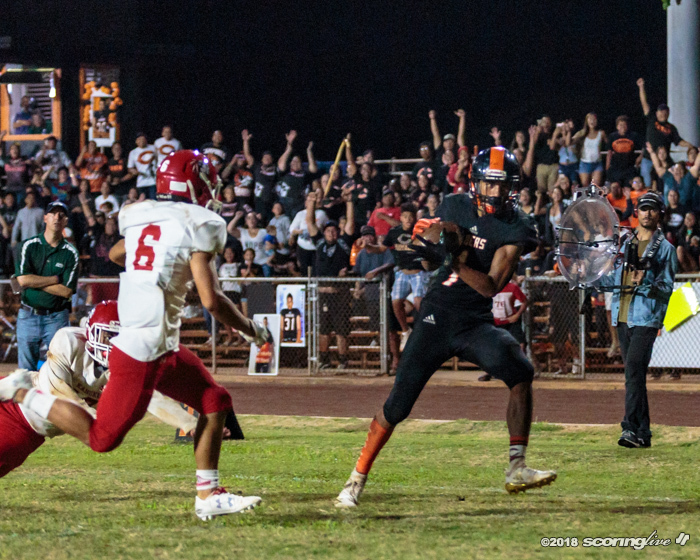 But Campbell answered with an efficient four-play, 80-yard drive to tie it at 27. 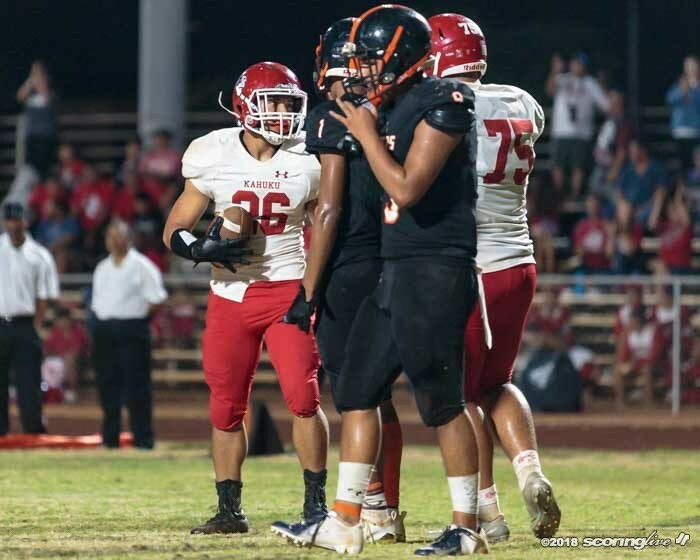 Kaipo hit Titus Mokiao-Atimalala for a 21-yard pick-up on first down before finding Tamatoa Mokiao-Atimalala for a 30-yard completion. 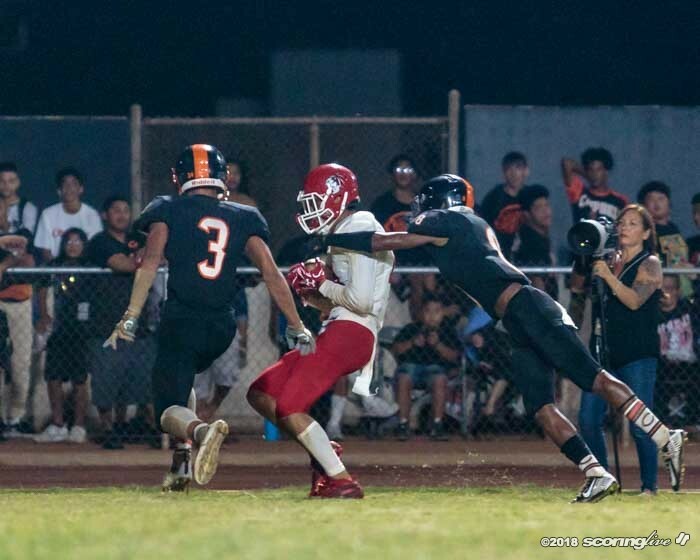 After an incompletion on the ensuing play, Kaipo launched a perfectly-placed deep ball down the left sideline into the hands of Titus Mokiao-Atimalala, just as the latter crossed the goal line, for the 29-yard TD pass. 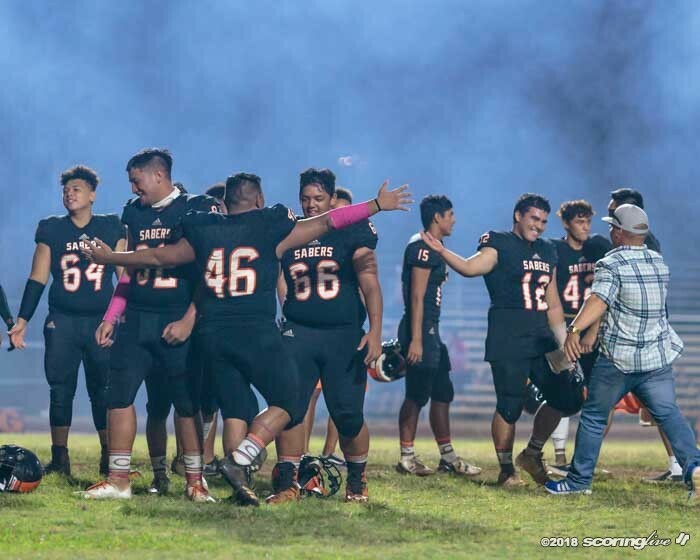 "Kawe (Johnson) just told me that I just had to make the play and he just told me to give a stutter-and-go, and once I hit to 12 yards, I just dropped my hips and then I took off and Kaipo just delivered a great ball and I'm just thankful," Titus Mokiao-Atimalala said. All five pass attempts on the scoring drive were toward the left side of the formation. "We saw that (the corner on that side) was playing off (coverage) throughout the whole game, so we were just taking the shorts — taking the five-yard outs, the 10-yard outs — so we just decided to pick on that and then when he finally got to come down, we knew that we could take it over the top," Titus Mokiao-Atimalala said, whose 814 receiving yards leads the Open Division. 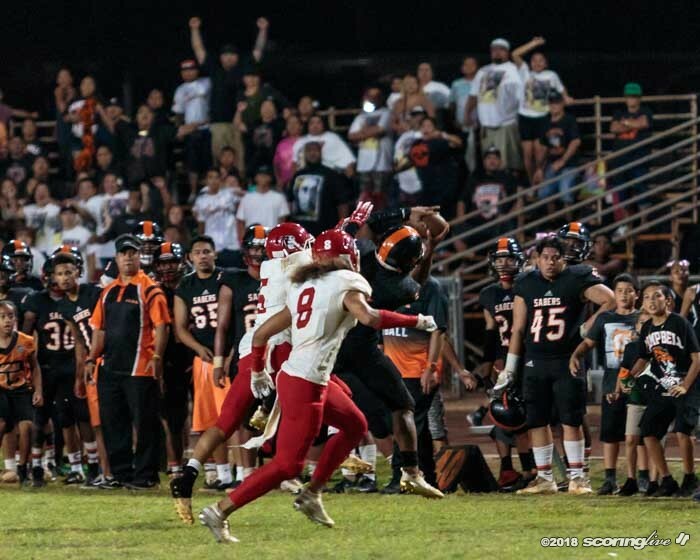 After a Kahuku timeout, Jadon Arola split the uprights with his extra-point try to give his team the lead for good. 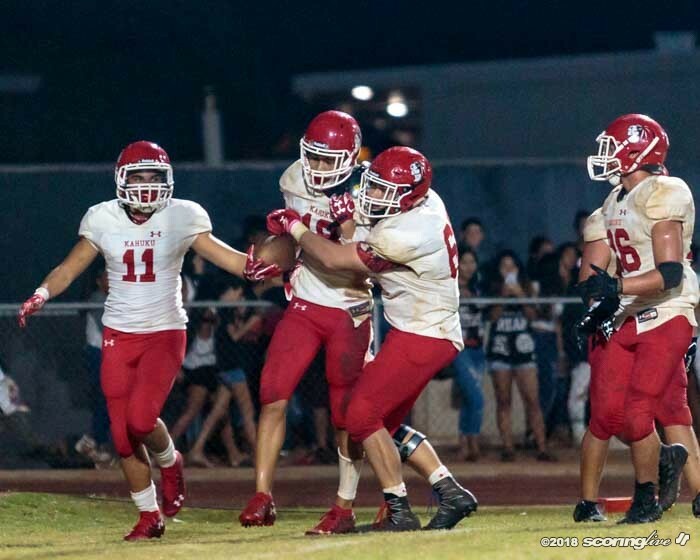 Kahuku got the ball back, but was unable to get past midfield before the time elapsed. "We told ourselves just to ‘finish,' " Titus Mokiao-Atimalala said. "I mean, we knew that we could come out and we could win. We came out throughout the whole week working, grinding it out and we just had to finish and that's what we did. I'm glad that we finished in this kind of way." Johnson said his son, offensive coordinator Kawe Johnson, put his butterflies at ease just prior to the possession. 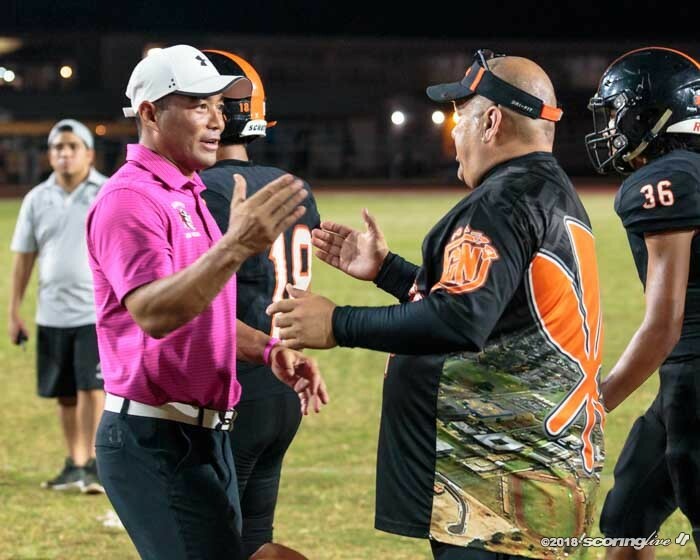 "You know, I was a little worried, (but) my offensive staff, Kawe, that whole staff said, ‘coach, we got it. Don't worry. We got ya. We know what we're doing,' so they were ready to go. 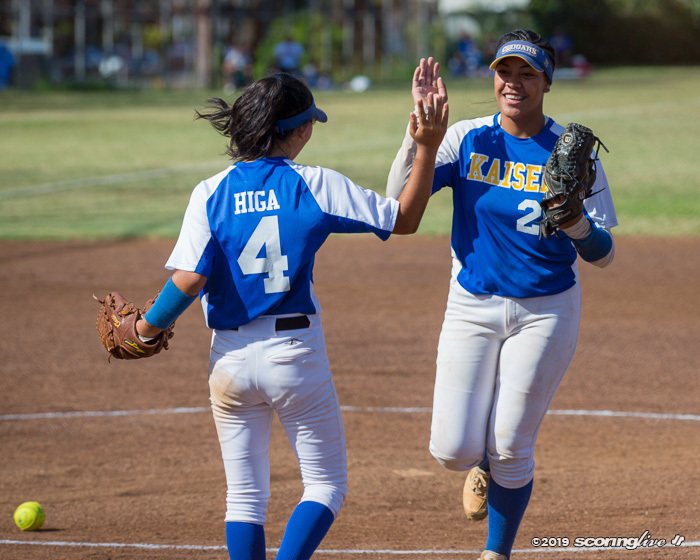 They were ready to go," said Johnson, whose ties to Kahuku run deep. 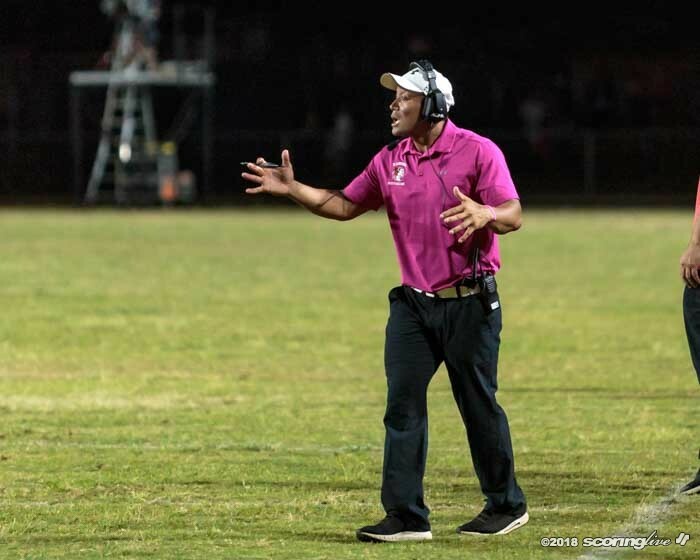 Johnson, a former Red Raider quarterback and 1983 graduate, had three coaching stints at his alma mater, including thrice serving as offensive coordinator. He also coached the boys basketball program for several seasons. But this one wasn't about him. "It's good for the seniors, they go out right, now we just gotta finish this whole thing right. This was real good. 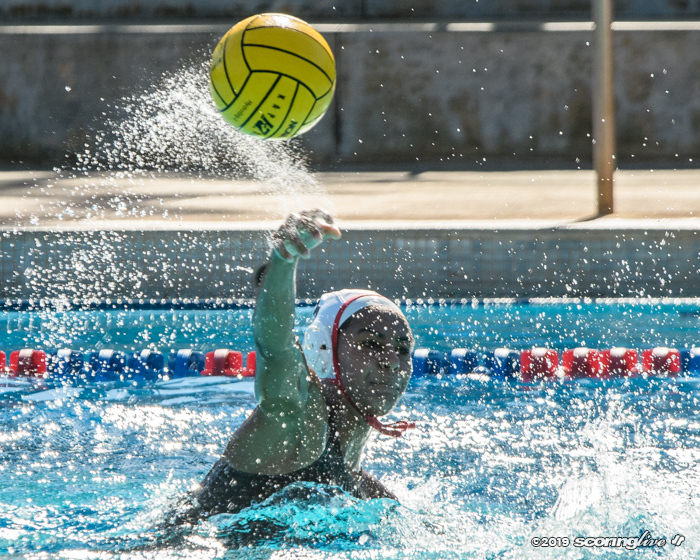 It's a real good home win," Johnson said. 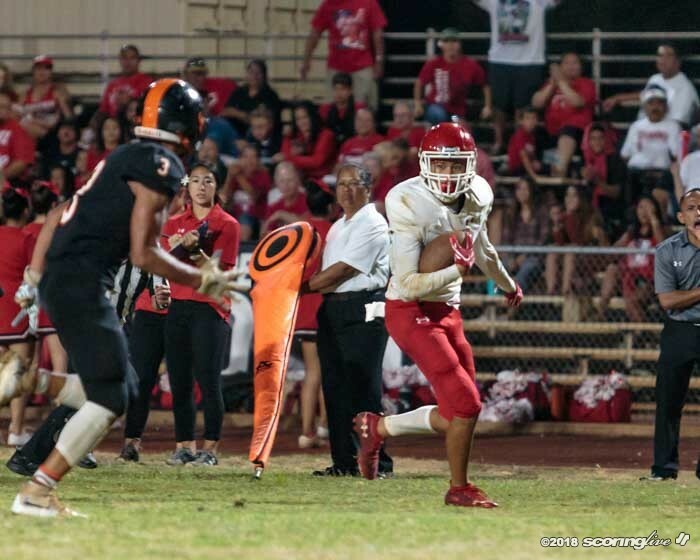 Zealand Matagi rushed for game-highs of 100 yards and two touchdowns on 19 carries for the Red Raiders. Sauvao finished 8-of-15 passing for 120 yards. Both of his TD passes were to Paulo, who finished with six catches for 91 yards. "I told the kids that we just gotta look at ourselves individually and we all just gotta get better at what we currently are doing. 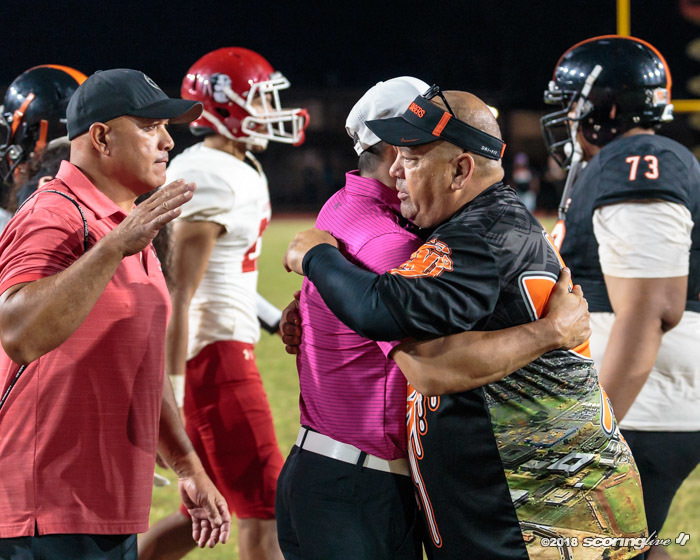 Blame no one else, but we just gotta take responsibility and be able to move forward from this," Kahuku coach Sterling Carvalho said. 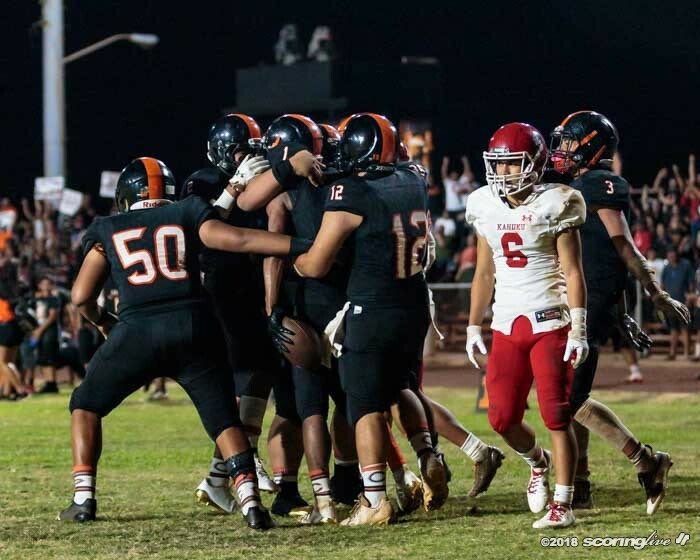 After a scoreless first quarter, the Sabers drew first blood with 8:06 left in the second quarter on JL Lavea's strip-sack of Sauvao, which was picked up and returned 46 yards by Brandon Frysinger for a defensive score. 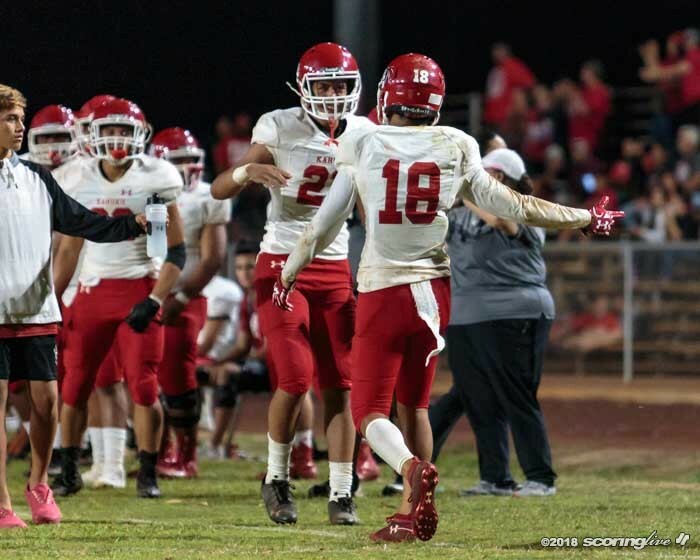 Kahuku pulled within a point after capping its ensuing 12-play, 55-yard drive with a 2-yard Matagi TD run. The drive took 5:41 off the clock and included a 5-yard run by Alex Fonoimoana-Vaomu on a fake punt to move the chains on fourth-and-4. 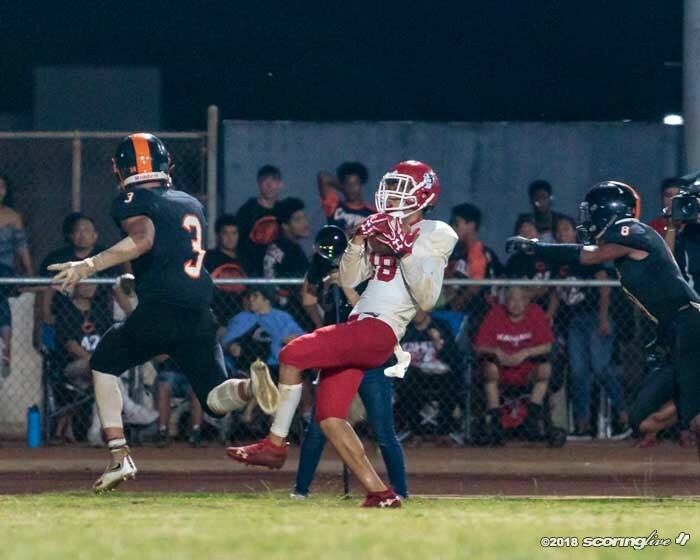 After Duke Heffernan tacked on the PAT to tie the score at 7, Joseph Taufa recovered the ensuing kickoff for Kahuku at the Campbell 25-yard line. 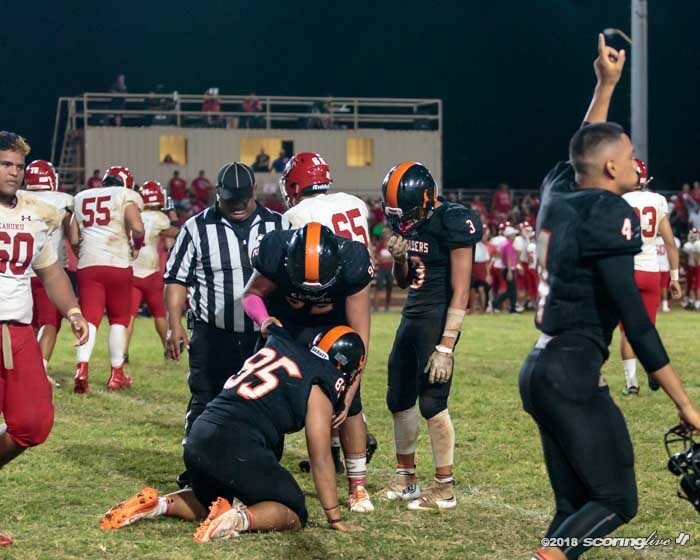 Five plays — and three false start penalties later — Sauvao hit Paulo on a 16-yard TD pass on a hitch-and-go route with 26 seconds left in the quarter. It was the Red Raiders' second score in a span of 1:53 and sent them into halftime with a 14-7 lead. 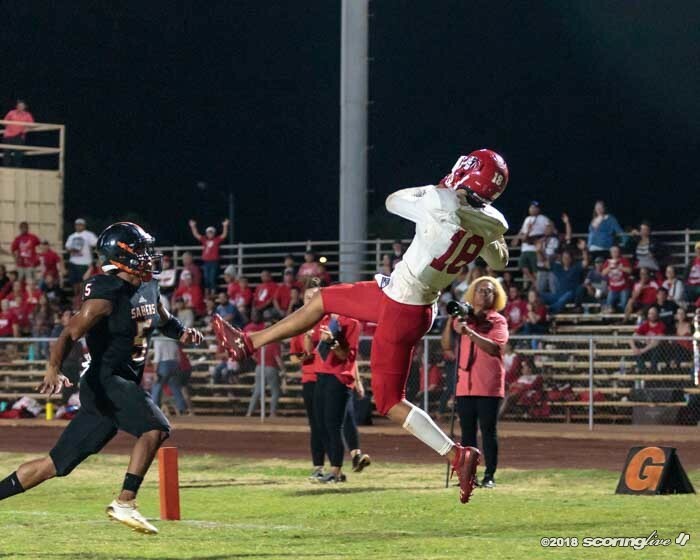 Sky Lactaoen's 7-yard TD run just past the midpoint of the third quarter — three plays after a 35-yard completion from Kaipo to Adkins-Kupukaa on third-and-8 — and Arola's PAT evened the score at 14 before Matagi's 3-yard TD run gave Kahuku a 21-14 lead with 1:19 left in the period. 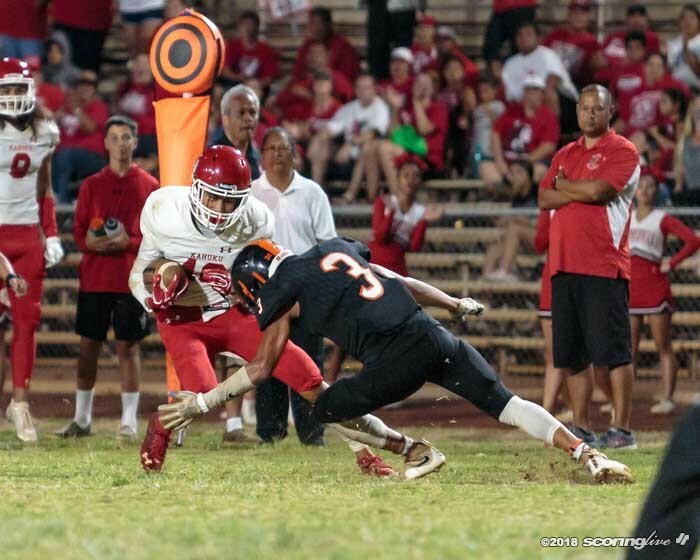 Kaipo, a senior quarterback, completed 10 of his 15 pass attempts for 172 yards and two scores. Kaniala Kalaola threw for 111 yards on 7-of-10 passing. 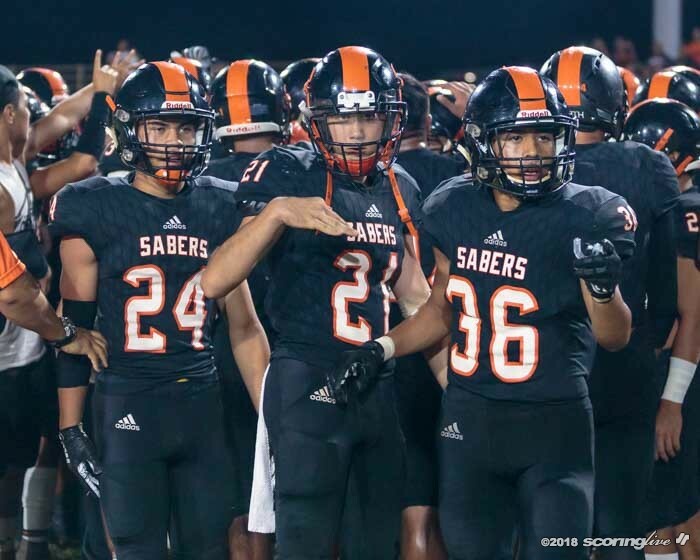 Lactaoen carried eight times for 48 yards and Adkins-Kupukaa finished with four receptions for 93 yards. 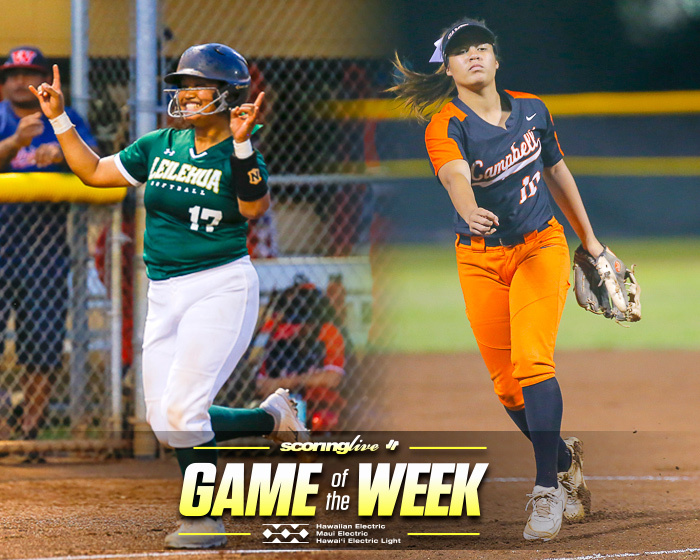 Campbell takes over second place in the OIA Open standings and closes out the regular season with road games at No. 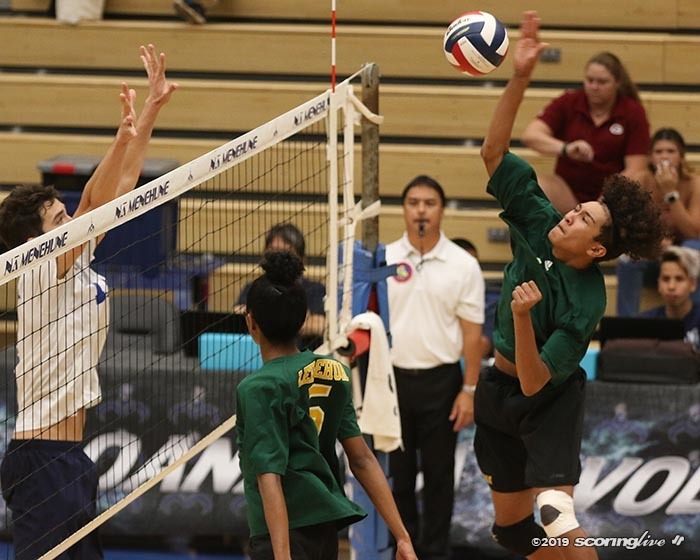 9 Kapolei Saturday and at Waianae on Oct. 19. The Red Raiders suffered their second straight loss and have now dropped three of their last four games to fall to 4-3 overall and 1-2 in league play. "Campbell is a great team," Carvalho said. "This is just a great league right now, so we just gotta be able to, like I said, get better at what we're doing." 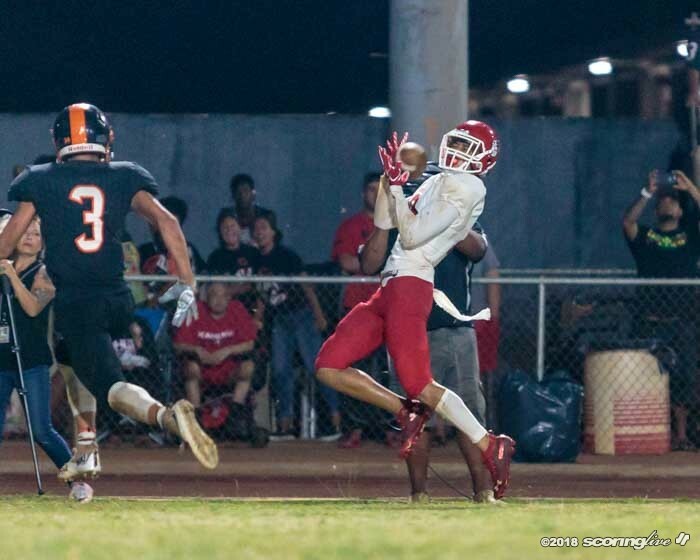 Kahuku fell into a tie for third place in the six-team division and will visit No. 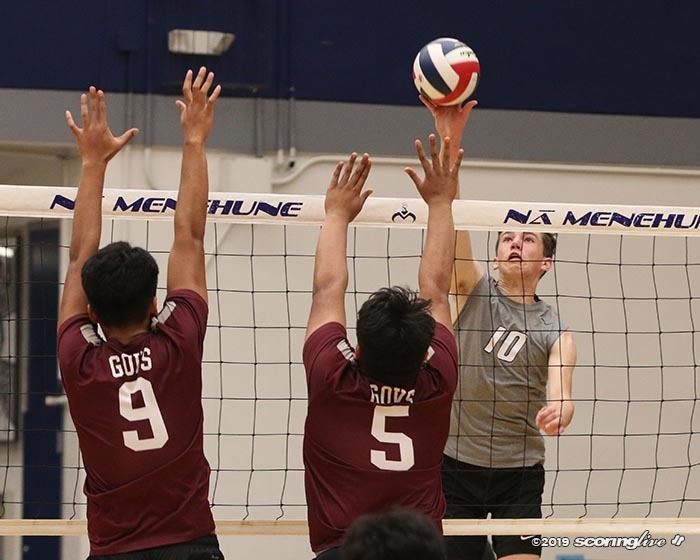 12 Farrington Friday before wrapping up the regular season with Kapolei on Oct. 19.